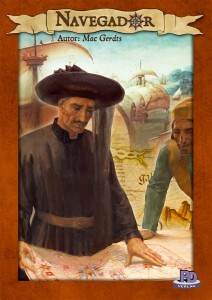 In Navegador, players are Portuguese explorers discovering new lands and making money from trading or processing the resources from the new colonies. The core game mechanic is the rondel – if you’ve played any of Mac Gerdts’ other rondel games (Antike, Imperial, Hamburgum) then you’ll know the deal. If you’ve yet to play a rondel game, the rondel is a circle split into 8 sections. On their turn, a player moves their piece 1 to 3 spaces clockwise around the rondel. The space that they land on determines what action they can perform that turn. A player can move more than 3 spaces but, in Navegador, each extra space costs 1 ship (which isn’t cheap but can be invaluable). Players can explore new sea regions by moving 2 or more ships into that region. They lose lose 1 ship, take the exploration marker from the zone, and gain cash equal to lowest value colony in that region. The 2nd and 3rd game phases are triggered when any player explores specific sea regions. Each new phase means that the costs for workers and ships goes up, ships can move further each time they sail, and more privilege counters are available. The game ends when a player explores the final (furthest) sea region (or when all the buildings have been built). Overall, I really enjoyed Navegador. To do well, you need to work in sync with the rhythm of the rondel but it’s not overbearingly prescriptive so you still have choices. You need to make the most of each action so must time having the right resources available, but I also like how the game lets you buy more items sometimes although at a high cost. 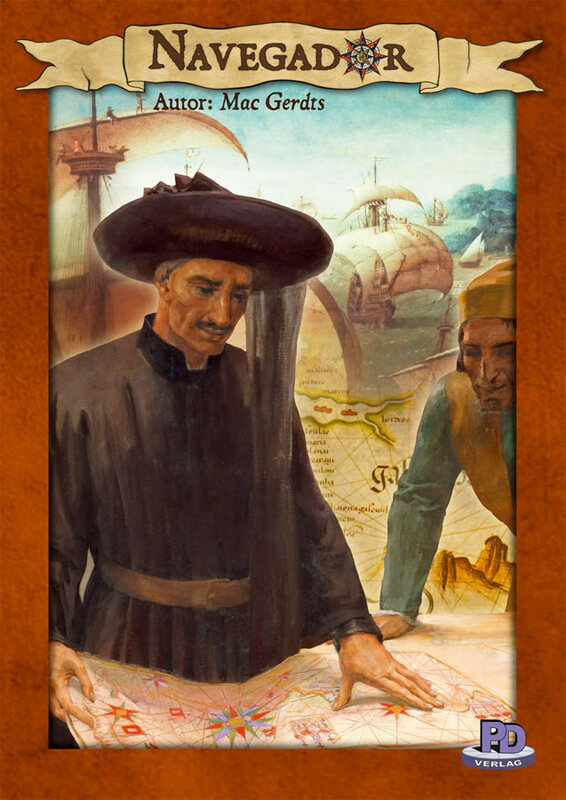 For example, during a Workers action, you can buy a number of workers up to the amount of churches you own for 50 cash each, but after that each worker costs 100/200/300 each (depending upon the game phase). So, rather than wait to buy another worker the next time you go round the roundel, you can buy more in one action (saving you an action too) but at a high cost. Buying ships works the same way but uses shipyards instead of churches. Cash is a key factor but you need to spend it in ways that allow you to make more too. You earn money from your colonies and/or factories during a Market action. For each good (sugar, gold, spice), you can either (a) use factories to process goods (increases its sales value & decreases its processing value), or (b) use colonies to sell goods (decreases its sales value & increases its processing value). I like the fluidity that this economic system delivers as you can affect the prices, but if you don’t work in harmony with what other players are doing you will earn less and less. Your level of workers is important as some buildings can only be built if you have a minimum number of workers (factories need 3 workers, shipyards 4 and churches 5), but there’s always the temptation to spend a worker to get a privilege counter. Cash is one thing but it’s VPs that will win you the game. The VP system is simple but a clever part of the game and it influences players’ actions during the game. You need to figure out how to maximise your VPs but you also need watch what items other players are collecting, as well as which privilege counters they’ve bought, to work out who may be after the items y0u want. 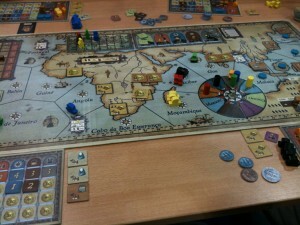 As players only have one action each turn, Navegador is a fast-playing game and turns tend to go by very quickly. Whilst you spend more time considering your own resources than other player’s, there is a definite tension in the air caused by concern that other players will buy what you want before you can (or buy something that means you now can’t afford what you were after). I can’t think of many negatives about the game. Some players may not like how you can only guesstimate what scores other players are on during the game, but I didn’t mind this. Of course, if you don’t like rondel games, then this definitely isn’t for you. I found Navegador surprisingly fast to play with lots of items to balance and consider, different ways to score VPs and there’s a good feeling of interaction without being direct or aggressive (although it is possible to affect other players plans). This entry was posted on Thursday, December 9th, 2010 at 5:17 pm	and is filed under Board Game Review, Board Games, Essen Spiel 10, Navegador. You can follow any responses to this entry through the RSS 2.0 feed. You can leave a response, or trackback from your own site.